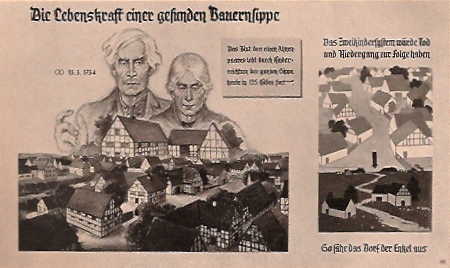 Background: Volk und Rasse was a monthly published by the J.F. Lehmanns Verlag, a leading racist publishing house that easily fit into the Nazi system. 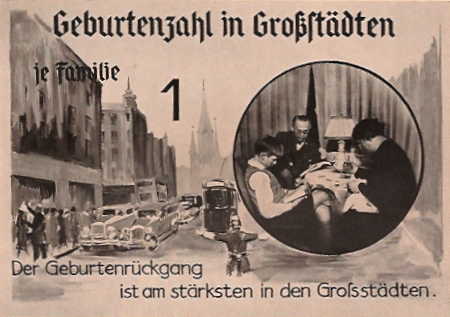 It published some anti-Semitic material, but focused more on the “positive” side of Nazi racial theory, the strengthening of the German racial stock. 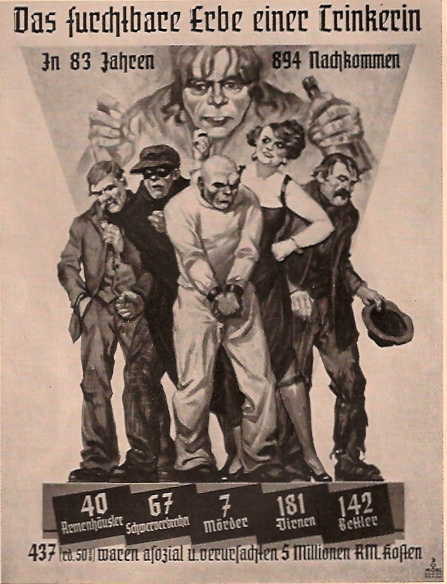 On this page, I include illustrations from the August 1936 issue that show posters displayed at Nazi exhibitions on race. 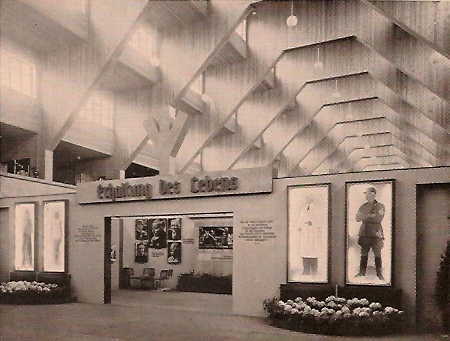 Many such exhibitions were held throughout the country in the 1930â€™s. The unpleasant drawings of those with “defective” genes are particularly interesting. 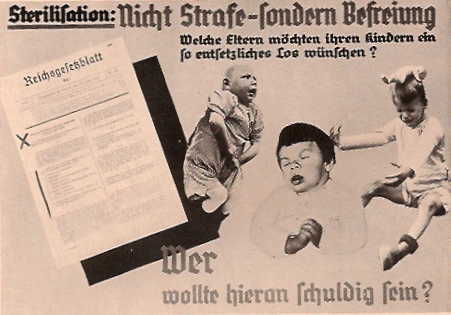 The goal was to build support for Nazi eugenics measures, sterilization of the “unfit,” etc. 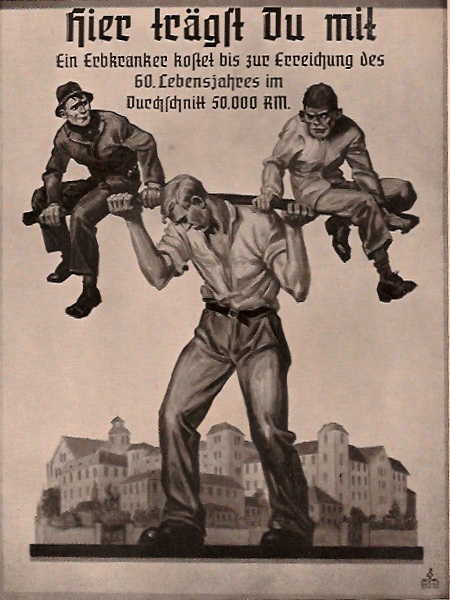 The source: Volk und Rasse, August 1936. The title: “The life force of a healthy farming family.” To the left is a farming couple who married in 1734, and now have offspring carrying their blood in 175 farms. 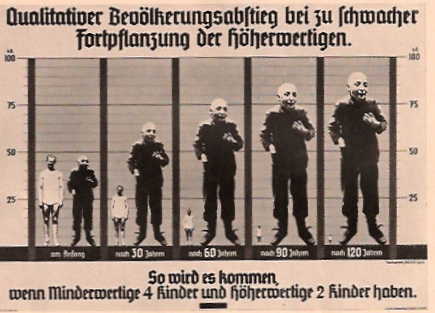 To the right, the caption says: “Two children per family would lead to death and decline.” The bottom right illustration shows deserted farms, were that to happen. This poster states that the decline in births is greatest in big cities, where one child is the norm. 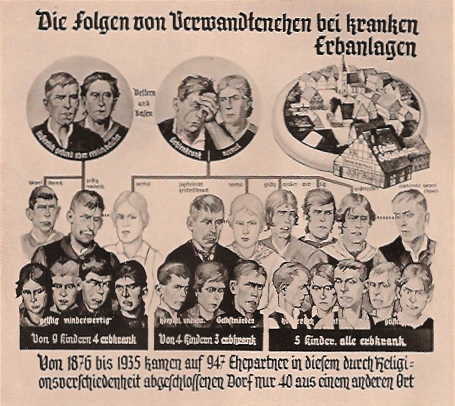 This poster shows what happens if parents of good racial stock have two children, but those of poor racial stock have four. They begin in equal numbers, but after 120 years the weaker are the overwhelming majority. This poster asserts that someone with a genetic illness costs the state on average 50,000 Marks by the time he reaches 60 years of age, which must be paid for by healthy citizens. 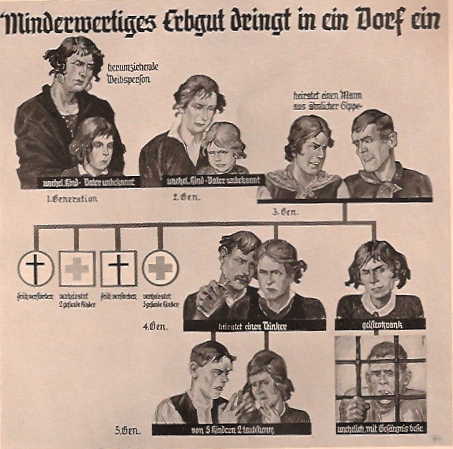 This poster shows what happens when relatives carrying a genetic illness intermarry. It claims: “Between 1876 and 1935, only 40 of the 947 marriage partners in this religiously-based community came from another place.” It shows that most such intermarriages produced children with genetic illnesses. Caption: “Bad genes enter a village.” This poster shows that a woman moves to a village and has an illegitimate child with an unknown father. In the second generation, the daughter has an illegitimate child. In the third generation, the child marries a relative. In the fourth generation, one descendent marries a drunkard, and they have five children, two of them deaf. Another mentally ill descendent has an illegitimate child who ends up in prison. Go to the Volk und Rasse Page.